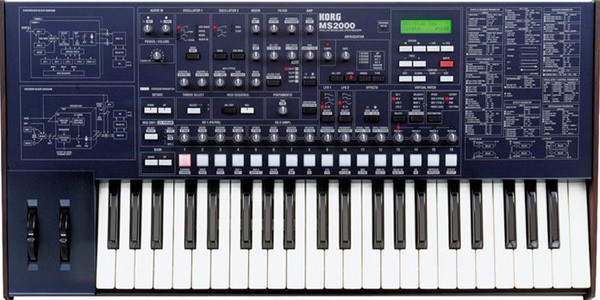 The Korg MS2000 is "virtual analog" synthesizer that was first released in the year 2000. 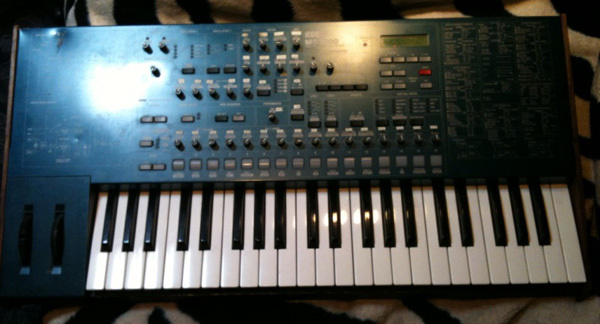 There are three versions - the original MS2000, which features a 3 1/2 octave keyboard; the MS2000R which is a rackmount version; and the MS2000B (released in 2003) which featured a dedicated microphone input for the vocoder and a new sound set. It's clear from the model name, "patch matrix" and the 'retro' styling (including real wooden side panels!) that Korg was giving a tip of the hat to it's original "MS" series of analog synths - the MS-10, MS-20 and MS-50. However, the MS2000 series are polyphonic, fully MIDI-capable, and feature digital "emulations" of analog sounds as opposed to "real" analog - but having said this, the MS2000 is definitely capable of some warm analog-style sounds and solid bass. Korg MS2000 - this one looking worn and dented after hundreds of live shows - but still working! The MS2000 comes with 8 banks of 16 sounds (total 128), all of which are fully editable and overwritable. Sound comes in the form of two oscillators plus an additional "noise" osc. Oscillator 1 has a wide array of digital waveforms to choose from; with oscillator two having basic saw, square and triangle, and being detunable. Two LFOs are available, each with 4 possible waveforms, and are assignable to a number of destinations. The MS2000 also has two envelopes and four filter types available. Most parameters are controllable via knobs on the front panel - of which there are 35. It's clearly laid out and this makes a welcome feature for those who like their sound control to be "hands on" rather than flipping through pages of menus and buttons - which the MS2000 has kept down to a minimum. In addition to a simple arpeggiator, the MS2000 has an on-board "modulation sequencer" which enables you to create 16-step patterns and program different settings (i.e. filter) for each of the steps. The built-in vocoder is probably one of the most interesting and fun features on the MS2000. Any sound can be fed into the machine through the vocoder input and processed through the vocoder - creating either archetypical "futuristic voice" settings or many other types of vocoded sounds. Effects are simple, with distortion, delay, modulation and EQ. One nice feature that I discovered on the MS2000, which is not often mentioned, is that each of the knobs not only transmits midi data, but can be assigned to transmit on any CC number (midi controller number). This means that not only can all of your real-time adjustments be captured (and returned) via MIDI, but you can also use the MS2000 as a MIDI controller to control other equipment. One minor criticism was the external PSU. After dismantling my MS2000 I discovered that there was plenty of space inside it - and putting the power supply inside would have been a nice touch. Prices: A used MS2000 can often be obtained for a bargain price these days. Looking at eBay, they currently (July 2010) seem to be floating between $380-$450 for the MS2000 or MS2000R - and maybe $500 for the MS2000B. Great MS2000 demo, various user-created sounds. Another user-created MS2000 preset demo.